Rihanna has her own collection of Umbrellas and wants YOU to buy them son. They are only $19.95. Each umbrella comes Rihanna's name written on it so everywhere you go people can see how corny you really are! But wait.. I hear these lil peices are SELLING like hotcakes! We should have seen this one coming. I'd rather get caught out in acid rain w/o an umbrella than to give her my $19.95. 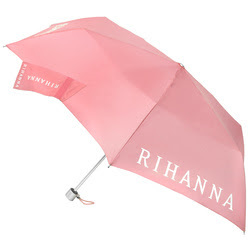 Why would anyone have an umbrella that says "Rihanna" on it. Lame. First they said it was $50.00 now the price changed to $19.00 something.... Umbrella my a%%! Rihanna's getting a little beside herself now...screw those umbrella's!